Additionally, a hate crime is committed when a criminal act is “committed against a person or [his or her] property with the specific intent of instilling fear or intimidation in the individual against whom the act is perpetrated,” because of a protected trait listed above. 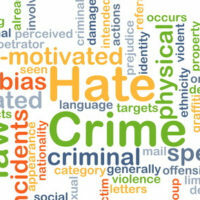 Depending on the crime and the defendant’s history, they may face anywhere from a Class 1 misdemeanor to a Class 6 felony for committing a hate crime in Virginia. A Class 6 felony is punishable by one to five years in prison and a maximum fine of $2,500. To be sentenced with a hate crime, the prosecution must have evidence that there was intent behind your alleged actions. Just because the victim was gay or was African-American does not mean that a violation against them would end in a harsher punishment for the defendant. There must be evidence that the defendant’s actions were motivated out of hate for the person’s race, color, religion, or other protected characteristic. If you have been charged with a hate crime, call the Loudoun County, Leesburg, Winchester, Fairfax, and Prince William attorneys of Simms Showers, LLP today at 703-997-7821.